What does the NOAA National Weather Service need with ammo? And lots of it. From MA, FL to CO, NJ, ME. 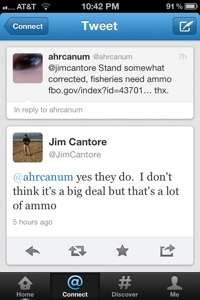 Is Jim Cantore packing heat? LI 001, 16,000 rounds of ammunition for semiautomatic pistols to be factory-loaded .40 S&W caliber, 180-grain jacketed hollow point (JHP). No reloads may be used with these weapons. All service furnished ammunition for issued firearms will be U.S. factory production. LI 002, 24,000 rounds of ammunition for semiautomatic pistols to be factory-loaded .40 S&W caliber, 180-grain jacketed hollow point (JHP). No reloads may be used with these weapons. All service furnished ammunition for issued firearms will be U.S. factory production. LI 003, 6,000 rounds of frangible, 125-grain CFRHT .40 caliber. No reloads may be used with these weapons. All service furnished ammunition for issued firearms will be U.S. factory production. 200 paper targets to: Troy Audyatis DOC, NOAA, NMFS, OLE, NED 53 North 6th Street, Room 214 New Bedford, MA, 02740. Anybody find a weapons requisition yet? And, after done with paper targets, who and what is a target? Is there an occupy the weather protest ahead? Or maybe a HAARP zap causing unrest? What the heck? Dale Jones, former director of federal fishing law enforcement, and his deputy director Mark Spurrier were removed from their positions in April 2010 of after a series of audits by U.S. Department of Commerce Inspector General Todd Zinser. Mr. Zinser and his investigators found that Jones had presided over wildly excessive and disproportionate treatment of New England fishermen, misuse of government funds, and a document shredding party while Zinser was actively investigating his department. Andrew Cohen, Special Agent in Charge NER, was relieved of his position in September 2010 due to findings of overzealous law enforcement practices. Over zealous law enforcement practices? Gr8, now about to be fully locked and loaded. long comment but arter I clicked subnit my comment didn’t show up. I think we follow each other already! Follow ahrcanum on twitter, we follow back! Sry missed your comment. Sure hope not going any where near Mideast! Can’t recall exactly but thought Weather Ch part of NBC Universal…GE . The Weather Channel was bought 2 years ago by the Rothschild Banking Syndicate & the CIA after which all things “Weather” became a NatSec issue,CRAZY!!! Some of the addresses used for these NWS ammo shipments are shared by the NED(National Endowment for Democracy) which just so happens to be supporting the Syrian “rebels” right now. Looks like these hollow points could be on their way to Syria. DHS has now illegally blacked out all information regarding these ammo purchases.